Providing an excellent template for locating and considering Hawks’ films, these reductive generic and auteurist generalisations paradoxically open up certain nuances, the noticing of which forms perhaps the major pleasure of being highly familiar with a director’s work, and a particular genre. However, such generalisations lead to some degree of myopia. In the case of Red River this appears to have been exacerbated by a reading tradition that begins with Wood’s and, via Oedipus, comes to be considered an exclusively masculine text allowing little room for marginal or alternative readings. That Red River‘s deep structure is Oedipal is obvious once pointed out. 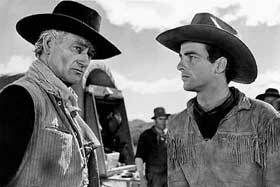 Revolving around Matt (Montgomery Clift) and Tom (John Wayne), the Oedipal drama is established in their first meeting. The young, traumatised Matt brandishes his small pistol, only to have it confiscated by Tom and returned with advice that is settled only by film’s end (or alternatively the film can only end once this ‘primal’ scene is resolved into ‘manhood’). The agreement over the cattle branding (“only when you’ve earned it”), the gun play between Matt and Cherry (John Ireland), Matt’s refusal to let Tom whip Bunk (who is, after all, another son), Matt’s decision to take control of the cattle drive, Cherry’s attempt to shoot Tom, and Matt’s refusal to shoot Tom, all stem from what is almost a ‘rites of passage’ narrative. The Oedipal theme deflects attention or concern from what Red River is ostensibly about; a great cattle drive across new and dangerous country to reach a market and realise the empire that has been built on the integrity, perseverance, and frontier nous of Tom Dunson. In combining this ‘straight’ Western, with what remains unsaid in the Oedipal narrative Red River shifts from being just a fine genre piece or one of Hawks’ better works, into something constituted by a series of intensities collocating around certain moments. One such intensity involves the relation and movement between the bracelet (once Tom’s mother’s), the cattle brand, the women and the cattle. It follows the pattern of exchange of the bracelet and the contested ownership of the herd just as Tom’s granting of the talisman to Fen leads to her murder and most of his stock (excepting a lone bull) being killed by Indians, the recovery of the bracelet leads to Matt’s arrival with cow in tow (feminising the young Matt). An analogous pattern is played upon the herd and the branding: with Matt taking control of the drive (expelling Tom) and giving the bracelet to Tess, which culminates in the successful sale of the cattle, resolving the battle with Tom and his gaining Tess. The cattle drive provides the metaphor allowing the shift of value from the herd (and its contested and ambiguous origin and ownership) to legitimating Matt and Tess (this is why Tom attempts to ‘buy’ Tess, treating her literally as stock, on discovering the bracelet that Matt has given her). This suggests why the film’s pivotal event is the cattle stampede. Schematically, this is caused by the son refusing to grow up (stealing sugar) causing a loss of control over the herd, leading to the death of the ‘good’ family man, which Tom (who has now become the ‘bad’ father) seeks to punish by pain and humiliation. On this basis Matt intervenes, prohibiting punishment. Similarly the film’s end, with Matt’s apparently inexplicable refusal to fight, is best considered through this schemata. While the film has established that Matt would defeat Tom in a gunfight, the requirement is not to kill the bad father but to allow the ‘bad’ father to return as ‘good’ father. This is as important for Matt as for Tom. If Matt simply killed Tom, usurping his position as patriarch, the status and authority of the ‘bad’ father would be preserved and legitimated (after all, Tom’s autocratism has been characterised by his willingness to kill). From Matt’s point of view the only way to legitimately become the ‘man’ is not through the killing of the father (Freud in Totem and Taboo, and Civilization and its Discontents has already laid out the consequences of those actions) but through deferral (which has already been performed – the branding and ownership of the herd) and ascension. The eventual fight will not end with a victor, but in equanimity, and can be considered equally as Matt’s ‘rescuing’ of Tom and Matt’s validation of the ‘good’ father. While Red River can be considered a boys’ own rites-of-passage there are key moments that escape, or lie outside of, what has been conservatively defined as masculine. Some of these revolve around the two key women, and the film appears to acknowledge something significant that it cannot say. The first is at the beginning, when Tom tells Fen that it is “too much for a woman.” Rather than offer an argument, she simply invites him to hold her, suggesting and offering her body as proof in place of words. Tom doesn’t ‘get it’ and the cost of this is not so much extreme as despairing. A similar moment occurs when the cattle drive gets under way, the film almost stopping for a series of extraordinary close-ups of cowboys yelling and hollering. It is a point of great narrative import (the struggle begins) but rather than articulate this the film slides into inarticulate sound and music. Finally, Tess’ presence at the film’s end reveals that while the men haven’t understood their own battle, she has all along. While Matt and Tom fight they collapse into a shop cart, pointedly containing home-wares and haberdashery. The gun Tess draws on them she mockingly declares unable to use (after already firing it and wounding Tom) because it “isn’t mine, it’s his”, throwing it back to its ‘rightful’ owner. This is the strength of genre: the variations and nuances an informed genre piece contains produce the small fragment, the subset, that reverberates through the larger set of the film, the oeuvre, and the genre. This is what Hawks does extremely well, and Red River is one of his best examples. Adrian Miles teaches and researches hypertext, cinema, interactive cinema and hypermedia at RMIT, Melbourne, and at InterMedia, Bergen. He consults on hypermedia pedagogy, ecultural strategies, and interactive video.